Dragon Ball Super: Broly's official introduction of Gogeta into canon has fans once again discussing the pros and cons of Dragon Ball's fusion methods. Well, a new article in Weekly Shonen Jump has now given fans an official breakdown of the two Dragon Ball fusion methods (Fusion Dance and Potara), and what the strengths and weaknesses are of each. There's also another official ruling on something that many fans have been debating for years: who would win in a fight between Gogeta and Vegito! "Dream Match!! 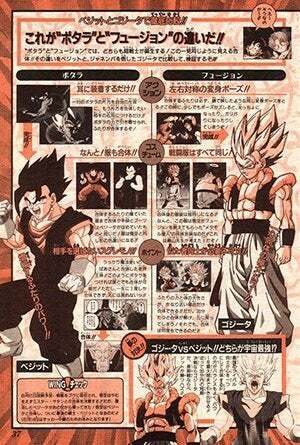 Gogeta vs Vegetto!! Who is the Strongest in the Universe?! Unifying the spirits of the two strongest rivals and merging them together, Fusion has better balance and is able to draw their power out to the max!! Therefore, if it is a short match of thirty minutes or less, then Gogeta should win, while if it is a long battle, then Vegetto should win!!" The Fusion Dance makes for a more powerful body/soul merging - but it's one that can only last for half an hour. The restrictions to achieve that fusion are also very tight; it takes a formidable amount of practice and poise to complete the Fusion Dance, and the warriors must be similar in size and power. The Potara is a much more stable method of fusion, and it can merge fighters of varying sizes and powers, with no time limit. However, that latter part is also the major drawback of Potara fusion: once it's done, it cannot be undone (though Goku and Vegeta have repeatedly broken this rule). As stated then, the issue isn't just one of the usual Dragon Ball power level number comparisons: it's about time vs power. Gogeta stands a greater chance of winning the fight if it's a quick head-to-head battle; however, if Vegito were to use any kind of real tactical strategy to draw the fight out, then the odds would shift all too quickly in Vegito's favor. Do you agree with this breakdown of a Gogeta vs. Vegito fight? Let us know in the comments! Dragon Ball Super: Broly officially releases in Japan this December, so fans will get to see more of Super Saiyan Blue Goku in action soon enough. Funimation will be bringing the film to theaters in the United States on January 16. Dragon Ball Supercurrently airs its English dub on Adult Swim during the Toonami programming block Saturday evenings at 9:30 p.m. It is also available to stream on Funimation and Amazon Video. The Japanese language release of the series is complete, and available to stream on FunimationNOW, VRV, and Crunchyroll.